Go through everything you completed this week and savor that moment when you cross the tasks off your to-do list! Giving yourself these rewarding minutes is the perfect way to end the week on a positive note. Call your boss and teammates to see if they need any last minute assistance and learn what they foresee as priorities for the upcoming week. This will help you set expectations and plan accordingly. After you crossed off completed projects and talked to your team, take a hard look at what’s left to do and prioritize for next week. If you get a game plan in mind, it will be easy to get motivated to tackle the upcoming week. This might seem simple, but taking time to tidy your workspace is another way to end a busy week on the right note. Organize those loose papers, go through desk drawers, recycle anything unneeded and then wipe down your desk. A clean workspace is a happy and productive workspace! Remember, it’s a five-day work week, not a four-day week. 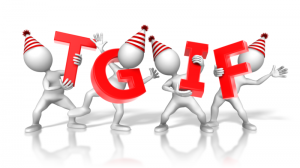 Take full advantage of Friday afternoons, and get ready for a great weekend and another successful week at work! TGIF! Have an additional tip? Leave us a comment. This entry was posted in Currently Employed and tagged Fridays at Work, setting up a successful week, successful Friday, tips for a successful week. Bookmark the permalink.